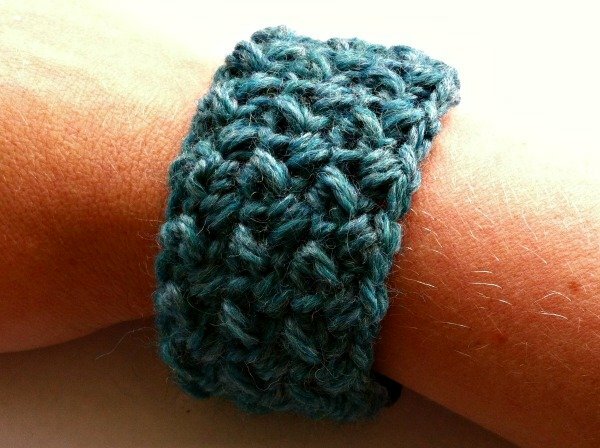 Simple Textured Cuff - Free Crochet Pattern - love. life. yarn. This cuff was inspired by the awesome wooden buckle I found at my local Joann. It has pre-drilled holes and is so easy to sew on. You don’t have to know any jewelry making techniques to create this simple cuff. I just knew I had to create a chunky cuff to complement it, and since I had some Berroco Ultra Alpaca left over from another project it was a no-brainer to put the two together. It really takes just a little yarn, so if you have one skein you can make lots of these or have enough left over for another project. I love the Ultra Alpaca so much I am planning another project with it really soon! Row 1: Mbs in 3rd ch from hook, *ch 1, sk 1 ch, mbs in next ch; rep from * to end – 25 sts. Row 2: Ch 2, mbs in first st, *ch 1, mbs in next mbs; rep from * to end. Block. Using long tails, sew buckle clasp to ends. That’s it! See, I told you it was simple. 🙂 Be sure to check out my other free crochet patterns. I got this buckle from my local Joann store. It may have been originally for beads. It has a few pre-drilled holes in it that I used to sew my stitches to. The link in this post will take you to the exact one I bought. You can purchase it there or head to a craft store to get one.